The Karen Adams Microlending Project was established in 2005 from the estate of Karen Adams, a victim of breast cancer who wanted her inheritance to be used to support those most in need in our world. The Microlending Project aims to support the economic and organizational development of women by establishing Microlending Committees for women in rural communities in north central El Salvador. Project Salvador has continued to raise additional funds for this project which has expanded to 18 communities in 2008, with a 100% payback rate on credit loans ranging from $50-200. Over 500 women and their families have benefited directly from this project. Candelaria and Josefina bought an industrial stove and set up their own “restaurant” in the community plaza. On Mondays and Fridays they sell pupusas—a Salvadoran tortilla stuffed with beans, cheese and/or chicharrones. On Wednesdays they sell Salvadoran enchiladas. The capital for their start-up loans came from Project Salvador’s Karen Adams Microlending Project. And their micro-enterprise means that Josefina, a widow with 3 children, has a steady source of income to meet her growing children’s basic needs. For Candelaria and her husband, it means that they struggle a little less to make ends meet. 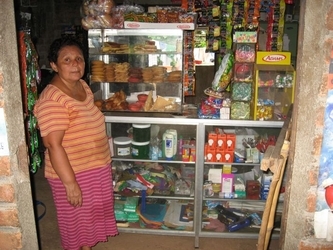 Microlending has become one of Project Salvador’s cornerstone projects, with over $65,000 in funding committed since 2005. Now celebrating year 7 of the project, there are currently 23 microlending committees in Suchitoto, Cuscatlán (in the north central part of the country). Over 750 women have taken out more than 1700 loans ranging from $40-$200 each, with a 98.5% payback rate! For the Project Salvador Board, getting into microlending was an organic process, evolving with time. In 2003 Project Coordinator, Patty Lawless, had provided seed money of $1000 for the Women’s Committee in the community of Papaturro, to be used on a project that would strengthen the organizing of women in the community. They brought it to a vote of the general assembly of women and decided that a microlending fund would be of greatest long-term benefit to the women there. The Papaturro innovators elected a “loan committee”, and developed the criteria for the selection of loan recipients as well as the structure for the administration of the loans, including an impressive accounting and tracking system. After the first year, the Papaturro Committee was thriving, with thirty women having benefited from six-month loans of $50 to start or strengthen income-generating projects in their community. The payback rate was 100% and Lawless was able to get another $500 to expand the fund. Women were making cheese, raising pigs and chickens and turkeys, opening up little “restaurants”, selling clothing door-to-door, expanding local “stores”, making uniforms for school children—the creativity abounded as women were experiencing financial independence and the opportunity to meet the basic needs of themselves and their children. As the Papaturro project flourished, women around the region were taking note and inquiring about the possibilities of starting microlending funds in their communities as well. When the Project Salvador board received the notice in 2005 that the Karen Adams’ estate was going to make a substantial donation to our work, the writing was on the wall—microlending, using the Papaturro model, was ready to replicate and interest was high! The Board empowered Lawless to grow the project on the ground, working with regional women’s organizations to provide both the visioning and the administrative connection in El Salvador to develop the project. Working with three organizations (APDM, PROGRESO and CRC), a Microlending Team of five women organizers began identifying communities that were ready to establish a microlending fund through their women’s committees. Five communities were identified for the first roll out in 2005, which included 2 training sessions for the women elected to each community’s microlending committee and 3 additional trainings for the treasurers. The first year went very smoothly and the Karen Adams Microlending Project was up and running! The Team in Suchitoto has continued to play a key leadership role in this work, providing follow-through with each of the 23 committees, troubleshooting when there are challenges to be addressed, training new committee members and treasurers when there is turnover. They will be identifying four more communities in 2012, bringing the total to 27. The Project Salvador Board is committed to supporting this work, counting on the continued generous contributions of our donors. There are many communities still waiting for funding, and the results are indisputable. The dual goals of the project have been met beyond expectations: providing opportunities for women to generate income, and strengthening the organizing of women throughout the region—a worthy legacy in honor of Karen Adams. Karen Adams was a woman from Hawaii who was dying of breast cancer. She decided to donate her estate to organizations that were serving the poor throughout the world. She found Project Salvador on the internet and gave us 1/7 of her estate! $20,000 of this fund went to kick-off the Karen Adams Microlending Project!